Friederike Mayröcker’s poems are often dedicated to specific people and thus constitute a very present act of communication. Among Austria’s most celebrated poets and author of over 100 books, Friederike Mayröcker often arrives before American audiences via a description of the one-bedroom apartment/writing studio she has inhabited since the 1950s. Google image searches find her there, hunched over a typewriter and surrounded by colossal piles of books and papers — think Kurt Schwitters’s Merzbau meets Jay DeFeo’s The Rose meets Francis Bacon’s studio. Mention of her lifelong partnership and her collaborations with fellow experimental poet Ernst Jandl, begun in 1954 and lasting until his death in 2000, often directly follows this description. Despite the problems of framing any female writer’s work with these two elements of domesticity — in her home and with her celebrated male partner — I’m compelled to repeat these snippets because they so vividly symbolize the layering and communication that give rise to the genius of Mayröcker’s texts. Scardanelli, translated by Jonathan Larson and released in English this November by The Song Cave, is titled after the nom de plume with which Friedrich Hölderlin signed his poems after he had gone mad in 1806. All of the book’s poems bear some relationship to Hölderlin, quoting from his late work and incorporating imagery — meadow, grove, sheep, violets, wanderer — found in his late poems. Yet, Scardanelli is not an attempt to occupy Hölderlin’s nom de plume, but rather a book written in the company of other writers, Hölderlin chief among them. 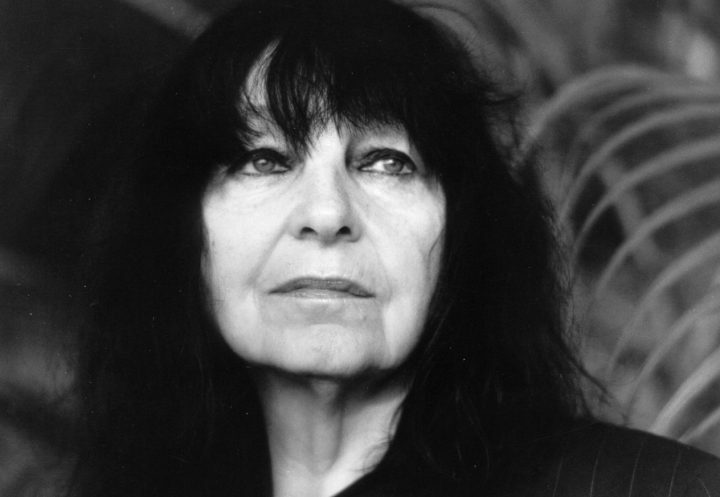 Dated and ordered chronologically, Mayröcker wrote all but the first poem in her eighth decade, after the death of Jandl, and Scarandelli’s existential tone reflects this. It discloses being as a state of impermanence, made of absence, while simultaneously so alive with traces of language, objects, and memory that pure absence, absolute death, are revealed to be false concepts. and as if on ice-skates. .), the beauty of the delirium in 1’s heart. As with so much of Mayröcker’s work, Scarandelli’s intertextuality runs deep and spans both literary and non-literary sources: Mayröcker tells writing students that they should read 10 hours a day; she immediately writes things down even while on the phone and these snippets become part of her texts. Furthermore, nearly all of Scardanelli’s poems are dedicated to specific people, calling to mind Frank O’Hara’s sentiment that “the poem is between two persons” and extending each poem beyond the author. The poem, offered in the poet’s absence, manifests a very present act of communication. Along with dedications, date stamps, quotations, and references to composition, Mayröcker’s other signature movements repeat across poems, weaving individual utterances into the textual body that is Scarandelli. Like “Hölderlin’s tower,” most of these are a single stanza and begin in medias res with a lowercase letter. Most unfold in a single breath-thought with few, if any, periods breaking up ideas, thus creating a music of parataxis that moves in rounded, inclusive gestures rather than jumpy accretion. Slashes, dashes, italics, and words set in all caps are not infrequent, although most curious is Mayröcker’s use of the digit “1” as we see in “I open 1 window” and “but 1 hears 1 sound of music there.” Larson’s “Translator’s Note,” which follows his eloquent and informative introduction to Mayröcker’s oeuvre, tells us that “both the indefinite article ein/e/n/m/r/s and the number eins are represented with the digit 1.” In addition, klein (small or little in German) is rendered as kl.) and einmal (one time) is written in digits as 1 x. “life’s billowing wave” begins back at the Hölderlin tower, in memory conveyed through fairly realistic description until the fourth line turns with “shores of abundant blos-/ soms resin in my heads.” Casually and mid-stride over the transformative nothing that is the end of a line Mayröcker multiplies the speaker’s head into a plurality, “heads,” identifying with the “abundant blos-/soms.” In the very next line she shape-shifts again, recognizing her “own shadow” in the “ ‘shadows of 1/dog in the river’.” Language slipping along so seamlessly in rounded inclusion brings these identifications into being, not as ruptures of a singular speaker, but as part of 1 subject’s nature. While this network of subject and object appears throughout Mayröcker’s oeuvre, it takes on rapt poignance in a book framed by conversation with Hölderlin/Scarandelli. Hölderlin’s poetry of the Open, his madness, his taking up a pen name, throw the boundaries and nature of the self into question. As he proclaimed in his short 1795 philosophical text “On Judgment and Being,” “Where Subject and Object are absolutely, not just partially united … there and not otherwise can we talk of an absolute Being.” Mayröcker innovates squarely within this tradition and there has been no other time as in need of such vision. 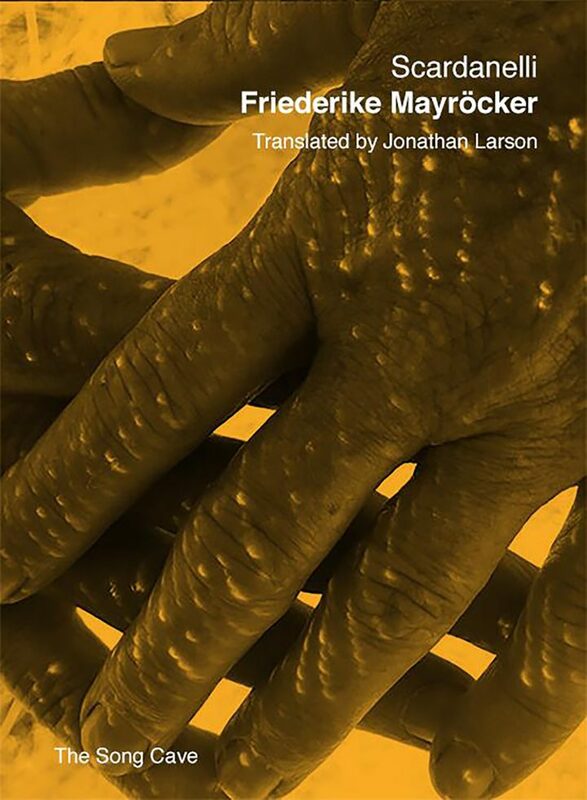 Scardanelli by Friederike Mayröcker, translated by Jonathan Larson is published by The Song Cave and is available from Amazon and other online retailers.